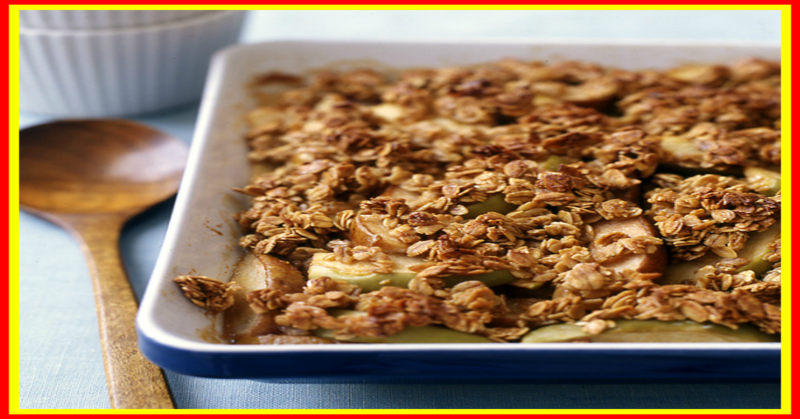 Spoon fruit into prepared baking dish and evenly sprinkle oat mixture on top; drizzle with melted butter. Bake until fruit starts to bubble and topping starts to brown, about 45 to 50 minutes. Allow crisp to cool for a minimum of 2 hours. * Cut into 9 pieces and serve. Yields 1 piece per serving. *The longer the crisp is cooled, the more the fruit juices will be absorbed. If the crisp is cut after two hours, the fruit will be a compote-consistency. Let it sit longer and it will become quite firm. Peeling the fruit is optional. Add 1/2 teaspoon of ground nutmeg and 1/4 teaspoon of ground ginger for a more robust spice flavor. Try this recipe with other types of fruit: three pounds of pitted, quartered Italian plums also make a lovely crisp.